Father Van Den Broek was a Dominican priest, who [sic] at age 48, was granted permission to become a missionary to America from Amsterdam, Holland in 1832. His goal was to save souls; [sic] whether they were the uncivilized Indians of La Petite Chute or the immigrants he brought to the region. He was a saintly man who left a life of social standing and wealth for a life of sacrifice, deprivation, hardship [sic] and constant toil. He arrived in Little Chute in 1835. An indian [sic] woman, Marie Anne, daughter of Little Wolf, immediately built him [Father Van Den Broek] a wigwam hut about 15 feet long and 6 feet high in a half day. For months it served as school, church [sic] and parsonage. This was the beginning of St. John Nepomucene Church. His [Father Van Den Broek's] congregation grew very fast and soon was in need of a church. Father Van Den Broek replaced his wigwam with a wooden church in 1836. It was 30 feet long and 22 feet wide. There were additions in 1838 and 1861. It was torn down in 1871. Little Chute was his primary congregation, yet he traveled regularly to many sites for pastoral services. Father Van Den Broek was teacher, doctor, and priest to the Native Americans and scattered settlers wherever they needed him. In Father Van Den Broek's words, "My labor is incredibly great; Sunday forenoon I preach in French, English and German; in the afternoon in the Indian language. Moreover, I have school everyday [sic], besides visiting the sick and making numberless journeys to distant missions. Nevertheless, I enjoy good health and everything, through God's help, is easy." In 1847, he returned to Holland to settle his mother's estate and to inform his fellow countrymen of the wonderful opportunities in the Fox River Valley. The number of those willing to immigrate to Wisconsin was so great that he had to engage three ships for the trip. He worked tirelessly to settle the newcomers. While celebrating mass in 1851, Father Van Den Broek suffered a stroke and died three days later. He was buried in St. John Church cemetery. 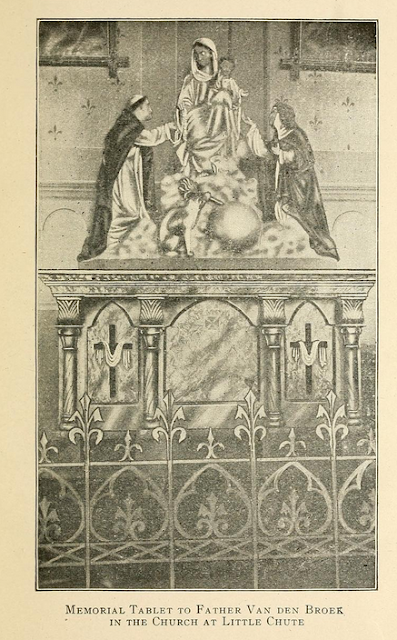 During a remodel of St. John's [sic] Church in 1894, his remains were found and were transferred to a tomb in the back of the present day St [sic] John's [sic] Church. The Menominee Indian Tribe had a village at the present site of Little Chute. They called it "ooukicitiming" meaning "Causeway". With the arrival of the French fur traders, it became known as La Petite Chute, meaning "Little" Chute, referring to the small water falls in the area. Little Chute was first described by James McCall, in 1830: "Little Chute is a perpendicular fall of one foot and continued rapids of more than a mile, and falls of about 24 feet on the west side of which is an island of considerable size and convenient for hydraulics. Opposite the island is a bottom of 200-300 acres of open land or prairie. On the back side is a handsome elevation of about 30 feet with scattering white oak." In 1836, the Menominee tribe sold 4 million acres for $700,000 to the federal government. The Treaty of the Cedars was signed at Little Chute in 1836. According to the treaty, the Indians moved away from the Little Chute to the Lake Poygan area, west of the Wolf River. This opened the Fox River Valley and most of the Wisconsin to white settlers. It also reduced the size of the parishioners at St. John Nepomucene Church, most of which were Fr. Van Den Broek's beloved Indian converts. He continued to minister to them in their new settlement. With the arrival of Father Van Den Broek's first settlers from Holland in 1848, the land was plotted and named Nepomuc. This name was not widely used and after Father Van Den Broek's death, the area was most often referred to as Little Chute. See also, WRL-116: St. John Nepomucene, at a nearby location. Looking southeast, with North Washington Street in the background. "At the last day God will not ask me whether my church was a wigwam or a log church. He asks not for church but for souls, and the soul of the poorest Indian living in the most miserable wigwam is as dear to Him as the soul of the greatest sovereign." A drawing of St. John Nepomucene about 1851. 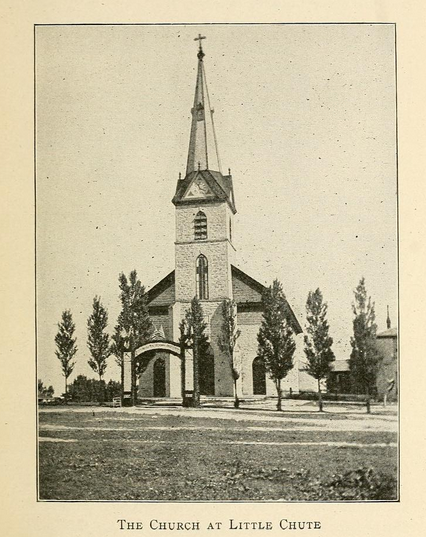 The church was soon razed for the present structure. The marker is visible to the far right.